Animals – Many free-range dogs! This must be a dream! Against the odds we are here, sweet St. Augustine! Today was one for the record books! We were up very early to drive the final 150 km from Havre St. Pierre to Natashquan, hoping to beat the snow storm looming just off shore. We arrived in a blizzard, stopping first at the post office to mail our food boxes. At the airport we began to understand the complexity and magic it takes to keep all the coastal communities supplied with necessities. 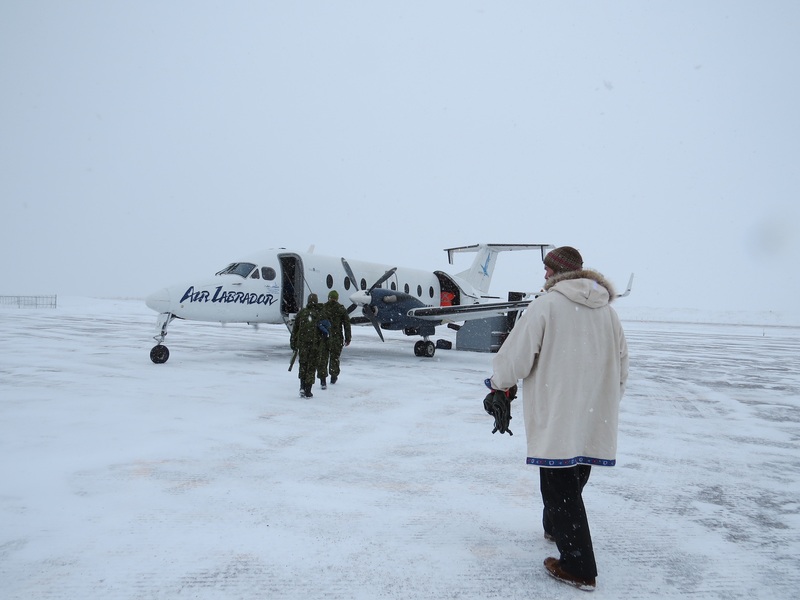 We were met by the friendly Air Labrador staff who, amidst all the normal puzzling of fitting mail, food, passengers and cargo onto two small planes were beyond kind and helpful in accommodating our gear and Osa…..excuse me, what’s that? Oh, yes, Of course! Osa would like me to tell you that despite how much she didn’t like the plane ride because it was noisy and bumpy, she is very happy to be in such a beautiful place and she loves everyone she has met so far. It’s true. We have arrived in a stunning landscape of bizarre granite hills, open frozen expanses and the most kind, friendly folks one can imagine. People watched us from their windows as we arrived in St. Augustine from the airport, across the river. Folks waved as they went by on sleds and students from the school greeted us from the doorways and windows with waves, excitement and lots of questions. Tonight, we will sleep in a spare room at the school and give a presentation tomorrow morning to all 45 students. 20-30 mm of rain is predicted for tomorrow (!?!) and we will use one of our allotted storm days. We are just so relieved (and exhausted!) to be here that we don’t mind at all. We are here, we have begun and life is great! All our love from the Lower North Shore!